Alan Lerner's work explores acts of violence in war time, as well as conflict in the context of every day life. 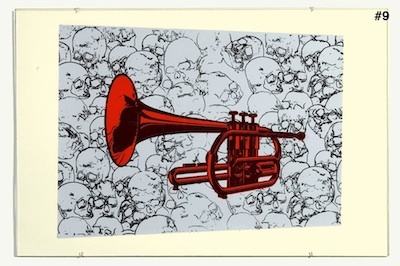 Juxtaposing civic rituals such as a marching band with injury and death in the war on terror, he illustrates society's need to"honor" and commemorate such geo-political conflict from a distance. The pomp and circumstance of the parade marching band is similar to the discipline and blind allegiance of the military ethic. The use of potentialy dangerous language is indicative of our society's inability to "just get along": our alphabet functions as a minefield.